“The sources of wealth themselves would run dry, for no one would have any interest in exerting his talents or his industry; and that ideal of equality about which they entertain pleasant dreams would be in reality the levelling down of all to a like condition of misery and degradation.” – Pope Leo XIII on socialism. Over 100 Million Americans are on Welfare. That’s one-third of the population. In the wealthiest nation in the world. One out of every three Americans. Stop and think about that for a moment. This extends far beyond simply providing a safety net for the impoverished and unfortunate; the welfare state is, in fact, nothing more than government bribing Americans with their own money. But, with one American in three living off of hand-outs taken from the other two for how much longer do you think politicians will be able to hand out these “free” benefits before they drive the other two-thirds of Americans into poverty as well? After all, this data point alone should convince anyone that our nation is governed by socialist principles, and history, economics and the Catholic Church have made it very clear that collectivism can lead only to destruction. the number of Americans on food stamps has grown from about 17 million in 2000 to 31.9 million when Barack Obama took office to 46.4 million today. The federal government spent a staggering 71.8 billion dollars on the food stamp program in 2011. The number of Americans on Medicaid grew from 34 million in 2000 to 54 million in 2011. Medicaid was supposed to help the poorest of the poor get medical care and back in 1965 only about one out of every 50 Americans was on Medicaid. Today, about one-sixth of the entire country is on Medicaid. It is being projected that Obamacare will add 16 million more Americans to the Medicaid rolls. But projections like that are usually way too low. Entitlement spending alone constitutes nearly 50% of the federal budget. The next largest money pit is military spending as a result of our aggressive military adventurism abroad. Both need to be scaled back drastically – and soon. Medicare is facing unfunded liabilities of more than 38 trillion dollars over the next 75 years. That comes to approximately $328,404 for each and every household in the United States. Socialists condemn advocates of a free-market and reduced government spending as “greedy” but we as a nation are addicted to government money – which is to say that we are addicted to other people’s money. What’s more greedy than that? When we demand entitlements we say its because we’re entitled to food and housing and medical care – it is our “right.” What we’re really saying, however, is that we are entitled to the fruit of other people’s labor and we can use force to take it from them. Their “debt to society” is a debt to me. Productive Americans “owe” it to everybody else. With incentives like those soon there won’t be any producers left. You can work 16 hour days in a fishery up in Alaska or you can sit at home and receive a check in the mail from the government. Which would you choose? What happens when enough people choose the latter? Government benevolence programs are illegitimate, an economic disaster and usurp the rightful role of the Church and private charity. There is a fundamental difference between living in a welfare state and having a safety net for the poor. The law cannot force people to be charitable – it can only forcibly take their belongings and give them to others. This only serves to pit Americans against Americans, to sow contempt where otherwise there would be none. We do have a safety net available to us that does not involve force of law or pitting neighbors against each other: its called charity. We are the most charitable nation in the world and we donate enough, not only to provide for our own poor, but to help countless around the world. By giving back to the American people what is theirs and restoring an anemic economy sucked dry by government “legalized plunder” private charity can only grow and, as a result, charity in the hearts of the American people can grow again as well. In response to attacks against religious freedom the American Catholic bishops have risen in defense of the church. However, many of the bishops, and many Catholics, have come to accept along the road the basic socialist principles that it is the government’s role to feed, clothe, house and provide medical care to its citizens. Thus, much of the Catholic community talks about how Obamacare’s attacks on religious freedom are wrong, but there’s some really good things in there too! Much of this sentiment is a reaction to our unfortunate corporatist system (which, sadly, too many Catholics – like Paul Ryan – support as well) in which the rich and the government cooperate to take from the poor and benefit the wealthy. The problem, however, is that the only way the government can provide services to the have-nots, either directly or indirectly, is through coercion, plunder and the destruction of liberty. This view is not in defense of the rich; socialism is not wrong primarily because it takes from the rich but because, like corporatism, it brings down society at large and harms the underprivileged most of all. In The Law, 19th century political economist Frederic Bastiat explains that, if the privileged classes use the government for “legalized plunder”, this will encourage the lower classes to revolt or use socialist “legalized plunder” and that the correct response to both the socialists and the corporatists is to cease all “legalized plunder”. Bastiat also explains that the law cannot defend life, liberty, and property if it promotes socialist policies. When used to obtain “legalized plunder” for any group, he says, the law is perverted and turned against the very thing it is supposed to defend. While many Catholics embrace socialist principles thinking that “capitalism has failed” they fail to recognize what capitalism even is. I think that many of our bishops make the same mistake and its not scandalous to say so. After all, they are priests – not economists – and while we would do well to always respect their authority we must also recognize their limitations. Those are the areas, not for rebellion, but for discussion. “Capitalism” is a broad term that refers to any economic model based in the individual ownership of property, a non-capitalist economy in contrast finds its basis in collective (that is, government) ownership of property. “Capitalism” may refer to both “good” and “bad” economic models: there’s corporatism mentioned above which probably best describes the United States (it is also the worst form of capitalism, combining the worst aspects of capitalism with the worst aspects of collectivism) but there’s also a hundred other variations like the classical liberal economic model embraced by Bastiat and even Chesterton’s distributism is fundamentally capitalist even though some distributism beg to differ (in fact, I would argue that distributism is even more capitalist in nature than many other capitalist models like corporatism in that property rights are more jealously protected for everyone, whereas corporatism demands systematic government seizure of property from the non-privileged). Corporatism has failed. Every flavor of centrally planned government around the world has failed. Capitalism remains largely untried. Thus sophistry is directly contrary to the intellectual tradition of philosophy and of Socrates and Plato who saw themselves, not as possessing wisdom, but as pursuers of wisdom. Instead, in the philosophical tradition wisdom was not something that could ever be possessed by mortal man, no matter how vigorously the philosopher pursued it. So, while the sophist is fueled by the ambition to possess knowledge, the philosopher treads down an endless road, and the fuel that burns in his heart is wonder: wonder at the world, at creation itself – and hope. The sophist sees the world through a microscope: reducing creation to numbers and chemicals and mass and wavelengths. The philosopher, in that experience that we’ve all felt at some time in at least some small way, transcends the environment of the sophist and finds wonder in the world, and in the philosopher’s heart burns the hope of expanding this enlightenment – not to dominate the world, but to see it in ever greater circles of experience. Thus, the philosopher grasps a reality that expands to infinity, and is far more human, more fulfilling, than that finite environment of the domineering sophist. The dichotomy between sophistry and philosophy is an important one in itself but it parallels another dichotomy in economics, a subject matter more pertinent to this blog. Namely, it parallels a stark difference between classical liberalism (similar to the libertarianism of today) and collectivism which is of supreme importance. Collectivism, and other structures like corporatism (a capitalist economic model) and despotism in nearly all forms, represents a centrally planned economy in which a solitary leader or a small minority of elites are, often under the guise of benevolence, in charge of making all of the decisions for society, “planning” and regulating society from their center of power. This correlates well with sophist thought, whose ultimate desire is the possession of wisdom and knowledge – for, as we’re all told, knowledge is power, and the sophist seeks knowledge, not for its own sake, but as a means to whatever end that the sophist has in mind. So, too, with the central planners: they have the power and, through their empire of bureaucrats, they seek to regulate and control the flow of information, to analyze every bit of information coming in so as to, from their center of command, better regulate all the capital and all the labor forces below them. The economy is one great machine and the central planners are its machinists. Conversely, classical liberalism bases its economic theory on the foundation of private property – not because government has no authority over its citizens or their property (it does possess the authority of eminent domain, to take property with just compensation to the owner for public use if it benefits the common good) but because the kind of knowledge and power necessary to “run” an economy can never be possessed. With property largely controlled by private individuals, ideally in the hands of as many people as possible, power is decentralized so that the public interest becomes manifest in the collective actions of all individuals working independently in their own self-interests. Is this a model of perfect efficiency? No, but one of the first axioms of economics is that in any economy there will always be unmet needs because we are not perfect and because all resources are limited. Only the sophist seeks the “perfect model,” to reduce the world to a formula. Instead, the free-market model represents the most efficient economy possible, by eliminating the need for anyone to actually possess the unpossessable knowledge necessary to centrally plan society. While central planners, in typical sophist fashion, seek to possess and change their environment, the classical liberal actively pursues a greater understanding of the world and changes his economic model to reflect it. Thus, we have the fluid model of the classical liberal in which each individual, each family, has the liberty to respond to the world as their own specialized knowledge dictates according to their own very specific and unique needs. The aggregate of these billions of daily responses by millions of people is what we call the free-market and no central planner, even with a bureaucratic empire at his fingertips, could ever replicate such a process or hope to possess the near-infinite variables and data points that went into shaping the market. Therefore, in this regard, it is in the tradition of philosophy that the free-market or free-trade economics of classical liberalism has its roots while the foundation of the central planners’ world, whether in the form of socialism, corporate fascism or some other despotism, is built upon the folly of the sophist. In the face of the upcoming presidential election the rallying cry of the GOP has been to “beat Obama at all costs.” However, while the Republican establishment is poised to crown Mitt Romney their champion we must ask ourselves, what, exactly, is the cost of beating Obama if it means a Romney presidency? Obama has accomplished much since 2008: he has expanded the power and breadth of central government and most notably that of the executive branch, he has continued the failed foreign policy of the Bush administration, broken countless promises, given us socialized healthcare, given himself the power to detain without evidence or trial any American citizen if he suspects them of terrorism, and he has gone to war against the Catholic Church in a battle that may see every Catholic hospital and charity shut down and re-opened under the state. That’s just a sampling. But, is Romney’s agenda really all that distinguishable from Obama’s? And if so is it really better enough to justify unifying under him so as to beat Obama “at all costs”? Obama’s socialist agenda threatens to destroy this country from the inside but Romney’s political policy should be just as abhorrent to the American citizenry. Under Romney we will have corporate fascism in which a powerful, centralized government and giant, politically connected corporations in the private sector cooperate and work hand-in-hand in their own self-interest at the expense of every-day working Americans. Below is an analysis on Romney regarding certain key issues and how a Romney presidency would affect America. More on Romney’s history as a flip-flopper here. FIRST number: Top donors to Romney 2012. Romney supports the NDAA which allows the executive branch to indefinitely detain any American citizen without trial or evidence based entirely on “suspicion of terrorism” effectively stripping all Americans of their right to Habeas Corpus. He also supports the drone strikes that, to date, have killed hundreds of innocent bystanders and claims that Pakistan is “comfortable” with the United States using drone strikes against their people. Additionally, Romney supports the Patriot Act and “enhanced interrogation.” In no way does Romney’s agenda regarding these issues of freedom vary from Obama’s own. Romney is in favor of the same kind of military interventionism that led us into two unnecessary and expensive decade-long wars in the Middle East that have crippled Afghanistan and Iraq, made the Middle East even more volatile, made the world less safe, resulted in the deaths of thousands of Americans and cost billions in national treasure. The Congressional Budget Office projects ObamaCare’s cost to be about $1.76 trillion. Most conservatives rightly recognize we can’t afford this. President Obama’s current military spending is about $1.2 trillion. Mitt Romney’s proposed plan calls for $2.1 trillion in military spending. Romney’s military budget alone dwarfs ObamaCare. The only ones to have benefited from the kind of foreign policy endorsed by Romney is the military-industrial complex. Meanwhile, Romney gives Obama an “F” on foreign policy – yet how Romney’s policy abroad significantly differs from Obama’s own, other than throwing more money at the problem, remains a mystery. According to the U.S. National Debt Clock our nation’s total liability per taxpayer is $1,039,057. That’s right, over one million dollars per individual. Our national debt accrues an annual interest of $11,971 per citizen. That’s how much you’d have to pay every year just to cover our debt’s interest. 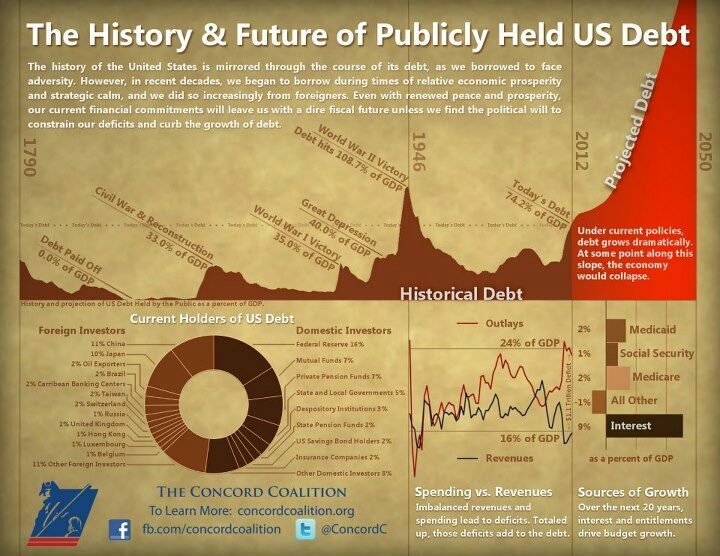 Foreigners own 32% of America’s total debt. Even more alarming is that all of this out-of-control spending is not being invested in long-term ventures that will benefit present and future generations but it is spent almost entirely on maintaining the massive welfare-warfare state that provides only short-term benefits to present taxpayers while our children will be left to foot the bill and nothing to show for it. We are experiencing an unprecedented debt crisis. Romney’s solution is to reduce our debt without raising taxes, eliminating any cabinet departments, reducing military spending, or cutting Social Security, Medicare, or any other popular program. How he intends to pull off this miracle, however, remains a mystery because he refuses to share the specifics of his plan until after he is elected. The one intervention that he has declared to implement is to bolster “free enterprise.” However, keep in mind that “free enterprise” coming from Romney means getting rid of all of those federal regulations that are smothering small businesses like Goldman Sachs. We’ve accrued this debt and its our responsibility to start paying it off. Today. Otherwise we pass this yoke on to our children, and their children, and on and on. What short-term benefits our out-of-control spending habits may yield to us now is nothing in comparison to the blow to future Americans’ very livelihoods when they must pay off their parents’ reckless use of the “federal credit card”. Under a Romney presidency our debt will continue to rise and with nothing to show for it. Romney has promised to repeal Obamacare – just like every other GOP candidate. Yet, Romney was the mastermind behind the universal healthcare mandate in Massachusetts that made Obamacare even possible in the first place. He is quite literally the least qualified person in all of politics to criticize a universal healthcare plan so how he intends to sell this to the American people is unclear. One notable difference between Romney and Obama is on abortion. Obama is easily the most pro-abortion president in the history of our country, but can we really expect Romney to reverse this trend or just sit on his hands making empty promises? Abortion is possibly the most emotional and controversial issue facing our country today and, given Romney’s history of bending with the wind, doing whatever is most politically expedient and never taking a firm stance on anything (at least, not for longer an election cycle), we can expect Romney to do absolutely nothing in defense of the unborn. When he went to conservative Utah, he changed his stance, “When I am asked if I am pro-choice or pro-life, I say I refuse to accept either label.” (Glen Warchol, “This Is The Place, But Politics May Lead Romneys Elsewhere,” The Salt Lake Tribune, 2/14/99). Keep in mind, however, that after his pro-life conversation he appointed pro-abortion judges, stated that he will “maintain the status quo” regarding abortion laws (see the above video under consistency), attended a Planned Parenthood fundraiser in 2004 despite his claims to de-fund the organization, and invested in two different companies involved in embryonic stem cell research – all of this occurring after his publicly recognized the sanctity of life and personhood of every unborn child. Pro-lifers, is this our champion? Are we really going to step into line for such scraps? If we are so easily manipulated into rallying behind such a lukewarm candidate, making every concession along the way then we can only expect the same complacency from the GOP, as well as the continued degradation of our liberty and our spiritual and material prosperity, for years to come. Meanwhile, over three thousand unborn children are killed every day in the US by government-endorsed abortion. Roe v. Wade took place nearly four decades ago; if we continue to settle for candidates like Romney who cater to the pro-life crowd based on political expedience then we are guaranteed another four decades before we see it overturned. Throughout his political career Romney has stood for everything – and therefore nothing – and in his capacity as a public servant the one that he has sought to serve has been himself, and the special interest groups that buy him off. Romney has a long history of increasing the power of government and then using that power to benefit his financial backers at the expense of the American public. Crooked banks like Goldman Sachs donate millions to Romney and in return he pushes an agenda of giving hundreds of billions of dollars to his friends in Wall Street, lifting regulations that prevent giant corporations from taking advantage of people and creating corporate-run bureaucracies. That is the classic definition of corporate fascism. Additionally, under a Romney presidency we can expect more unnecessary and expensive warfare abroad that only benefits the military-industrial complex, more national debt, a larger welfare-warfare state, a faltering economy, the continued stripping away of our constitutional rights and little to no progress on the issues of healthcare and abortion. Obama’s election was a direct reaction of the failed Bush presidency; I would hate to see what kind of man the American people would be desperate enough to elect in response to four years under the debacle of a Romney presidency. The dynamics of the free-market combined with a strong rule of law necessitates that man must serve others in order to earn a livelihood, to please consumers to make money. Only by providing a good or service better, with more ease of use for the consumer, and for less, can a man expect to get rich. Contrast this with Corporate America. With big government and massive federal bureaucracies that employ literally millions of Americans just to regulate the many aspects of a national economy, massive corporations counterintuitively gain power over consumers and industries as well. Why? Because the supposed “middle ground” between a free market society and socialism called Corporatism allows and even incentivizes men to get rich by buying off the politicians and bureaucracies that control so much. Its not a coincidence that many board members of government bureaucracies are also the CEOs of the very companies they’re meant to regulate. Massive corporations thus manipulate government regulations and use their political connections to receive subsidies and bail outs from Congress. Corporations that would fail in a free-market because of their repeated mistakes are instead fed with the money earned by the sweat of the American people and become leeches on society. The government thus enables greedy people to build empires on the backs of the 99%. This is precisely the kind of anti-social behavior a free-market can practically eliminate. However, even if every issue brought to Congress wasn’t politicized for the purpose of advancing careers, gaining personal benefits and pushing ideologies, even if we could ensure that the intentions of every politician and every bureaucrat were pure and just then centrally planned economies like Corporatism or Socialism would still only lead to dismal failure. Why? Because, as the old saying goes, the road to Hell is paved with good intentions. What matters, is not mere intentions (though we should always have the best intentions at heart) but actual actions and their consequences. The economy of a whole nation is incredibly sophisticated and every action has unintended consequences. Is price regulation with the intent of providing affordable goods and services a good idea if it means no one has pants but the market is being flooded with millions of buttons? These are exactly the kind of situations that plagued Soviet Russia. While warehouses were crammed with an overabundance of certain goods that no one was buying, people would line the streets for hours waiting for some much needed good in high demand but short supply. It is precisely because of the sheer complexity of economics that the politician’s job regarding the economy is so simple: protect rights and prevent anti-social behaviors (like the pursuit of monopolies for example) – because to centrally plan a national economy is far beyond the competency of any human being, or even an army of human beings like that needed to run our bureaucracies. We don’t need, for example, a President who can “run the country” but one who will create the conditions necessary to allow each individual to make his or her own decisions and thus each affect the economy in their own small way. Because only God could possibly manage the infinite variables of a national economy without treading the path towards rampant poverty for all. Instead of putting our faith in central planning, where the conceited few on the top make the decisions for everyone else we should instead relinquish the mirage of control. In a free-market society the masses make the decisions. No one person or group of people is in control pulling the strings. Instead, our society must be allowed to adjust to the practically infinite variables of our economy based on the trillions of little decisions made by 311 million Americans everyday. By divvying up the economic power of a nation among millions it thus becomes very difficult for the CEO of a massive company or the regulatory board of a leviathan bureaucracy to seize control, to cheat or exploit, or to, in any other way, effectively act on dispositions of greed. No amount of economic intervention can eliminate greed but with a free-market and strong rule of law we can at least render it impotent. Because, it is liberty and not Nietzsche’s Ubermensch, his superman, that is the prerequisite to economic prosperity.